Let me tell you, I am all over this embroidery trend! I was so happy with my embroidered dress last year, so it thrills me that I can now buy embroidered boots, jackets, bags... the lot. This jumper is just one example and I love it! 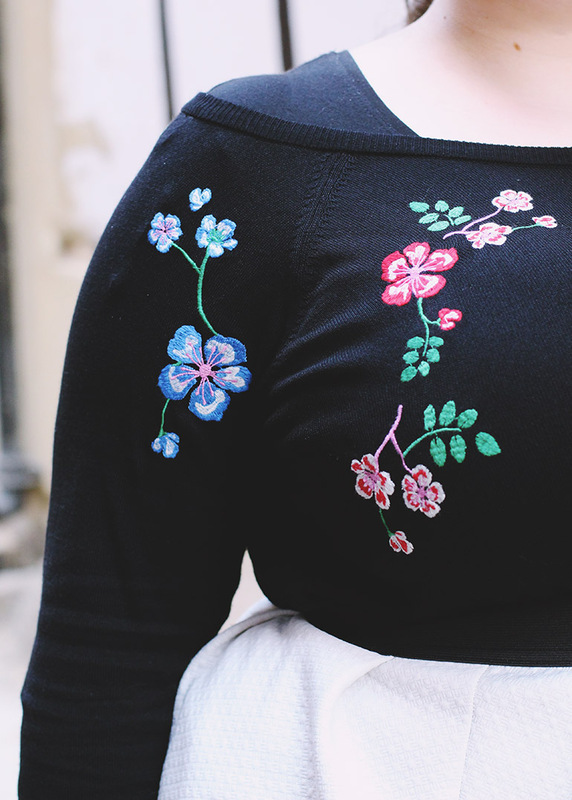 Obviously, this embroidered jumper is super cute but there are quite a few downsides. For one, it has raglan sleeves which, although I'd heard some negative things about, had never worn myself. I've decided I don't like them! They feel like they're pulling on my shoulders and sleeve always feels like it's twisted. This may also be because the embroidery snakes down the front of the arm rather than the side, adding to that somewhat twisted effect. The other problem I have is that the acrylic material is really rough. It's not scratchy as such but it's certainly not comfortable against the skin so I had to wear a t-shirt underneath, ruining the pretty bardot neckline. Luckily the material is very light so I didn't feel too hot wearing layers underneath, and it's so pretty that I think I can overlook these issues. I wasn't entirely sure what to wear on my bottom half and, after trying a few options, settled on my staple white skater skirt. Where would I be without this skirt? Because it's from Primark, the material isn't the greatest quality and it was really badly bobbled. 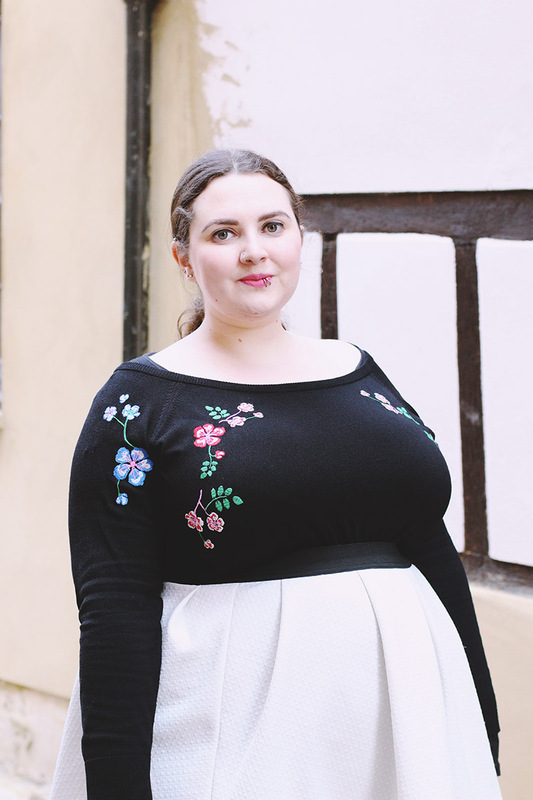 I was gutted because it's so comfortable and versatile (with a bonus elasticated waist!) and the thought of throwing it out pained me. First, I looked up solutions for getting rid of bobbles and found a bunch of people on a forum praising this debobbling device. To be honest, I thought it was probably not that great but since it didn't cost much, I figured I could afford to try it out. My God, it's incredible! It zapped off all the bobbles, without damaging the fabric at all, and I can't even tell you how satisfying it is. I wanted to go around the house and run it over everything! To finish my look, I threw on my black opaque tights and glitter heel ankle boots which are becoming my constant failsafe option. I should really push myself a bit more but I love how the slight heel changes my posture and I feel so confident clip-clopping along the street. For someone who spent years unable to wear even the slightest raised shoe, it's amazing to comfortably wear heeled boots, even if they are only a few centimetres high! Such a shame about the fact you have to wear a t shirt underneath as this is such a lovely piece to wear off the shoulder too! 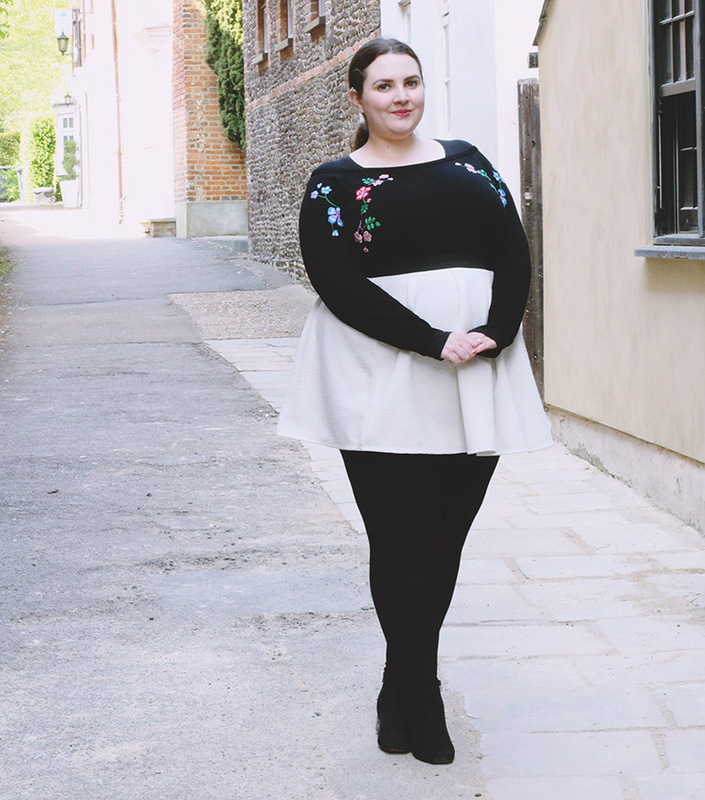 Love how you bed styled this outfit Becky!